You will love this beautiful Horseshoe Bay waterfront retreat located on the lake next to the Yacht Club. Newly remodeled, three-bedroom, three-story, vacation rental townhome. Master bedroom is downstairs with a large screen 46" TV, king-size bed with a new Sterns and Foster luxury foam mattress and a large bathroom with double sinks and large frameless shower. 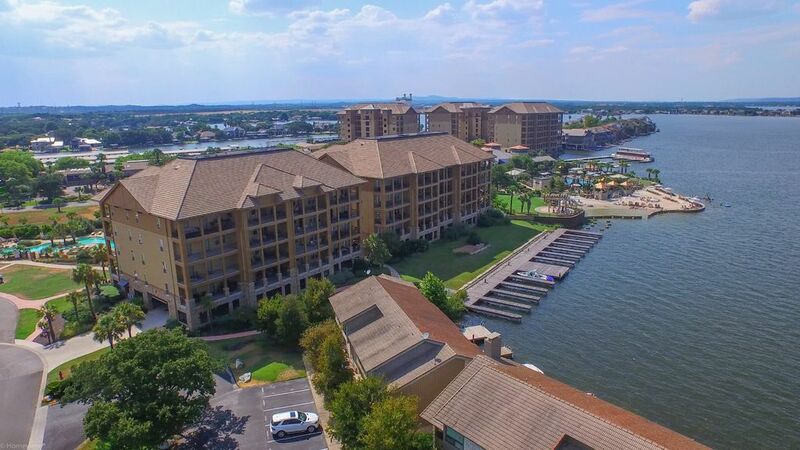 Two bedrooms on the third floor, each with a queen-size bed also with new Sterns and Foster luxury foam mattresses with one bedroom overlooking the beautiful waterfront view of the Yacht Club, the bay and the Lighthouse at Horseshoe Bay. Flat screen TV in every room. The townhouse is fully furnished and including washer and dryer. The kitchen has granite counter tops, dishwasher, disposal, and microwave. Living area has cable, high speed internet, 55" TV, and state of the art SONOS stereo system with Bluetooth/Blu-ray DVD. Two decks with a Weber Barbecue grill located on the upper deck. Should you require additional room for family, friends, weddings, or reunions, two other townhomes are available next to ours. All have the same accommodations. Might think about booking early if you need more than one townhome. Water activities include boating, skiing, fishing, wakeboarding, sailing, and tubing. The marina offers party boats, jet skis, and wave runners for rent. Horseshoe Bay has three of the finest golf courses in Texas along with the spectacular Whitewater putting course, a truly one-of-a-kind course. Horseshoe Bay is 45 minutes northwest of Austin-'the live music capitol of the world'. About 90 minutes north of San Antonio-River Walk, Sea World, and Fiesta, Texas. Within a 60-minute drive-Schlitterbahn Water Park in New Braunfels, historic Fredericksburg, the Hill Country, and The Texas Wine Trail. All bedroom bathrooms are new with high end fixtures and frameless showers doors. Top of the line, high quality sheets on all beds. 600 count or better. Very nice, updated and well maintained condo. Right on the water, with a private for our boat and also a two minute walk to the club pool! Also had TVs in every room along with Netflicks which came in handy with the kids at night and in between boat rides. The owner was very responsive and accommodating, he also offered a bunch of advice about Horseshoe Bay and the surrounding areas. I couldn’t give a higher recommendation! Thanks Karl!!! Very comfortable , great location, nice people , beautiful lake view. Up to date, clean beyond words, big showers, comfortable bed, and great dock. We had such an awesome time on Horseshoe Bay and made another year of memories! Thank you so much Karl for the generous hospitality and attention to every detail to make our stay so comfortable and feel like home away from home. The views of the lake on each floor of this townhome are spectacular, the comfort and easy access to and from the lake just made our stay here so enjoyable. We so loved that after each day of fun and sun on the lake to come relax and re-energize in this beautiful townhome and on the balcony to watch the sunset and see the view of the stars twinkle at night. I will highly recommend your beautiful place to all my friends and family and to anyone else that want a perfect place and view of Horseshoe Bay to make awesome memories. We were so happy that you had floats, comfortable patio furniture, plenty of room for all our family to sleep comfortably, the awesome sound system for T.V., music that you provided with playlists, the grill for cooking, etc.... again as I said everything we needed was at hand. Thanks again and we will definitely be looking to make future plans for another great family vacation in your beautiful home away from home. We had a fantastic time celebrating Mother's Day at this clean, updated condo! Easy access to the resort and local restaurants, and an unbeatable view of the bay! Our family of five had plenty of room and loved the instant access to the water. Thank you, Karl, for sharing your beautiful place with us! Thank you for your kind remarks regarding our condo. We are glad it met your family's needs for a memorable stay. Thanks again for trusting us with your accommodations over Mother's Day weekend. We look forward to your return the next time you find yourself in the Horseshoe Bay area. April-Sept: $375/Weekend night, 2 night minimum + $150 Cleaning Fee April-Sept: $325/Weekday night, 2 Night minimum + $150 Cleaning Fee April-Sept: $2000/week + $150 Cleaning Fee All Holidays - 3 day minimum Oct-March: $300/Weekend night, 2 Night minimum +$150 Cleaning Fee Oct-March: $250/Weekday night, 2 Night Minimum +$150 Cleaning Fee Parking is limited to 2 vehicles and no boat trailers are allowed. If you need to park a boat trailer, please contact the Marina at 830-598-9401 and ask them if you can park it at the airport.